Hi! Margy here. It has been a long time since I have written anything on the blog. A big thank you to Racheal for keeping things chugging along. I wanted to share with you a little project I have been working on. 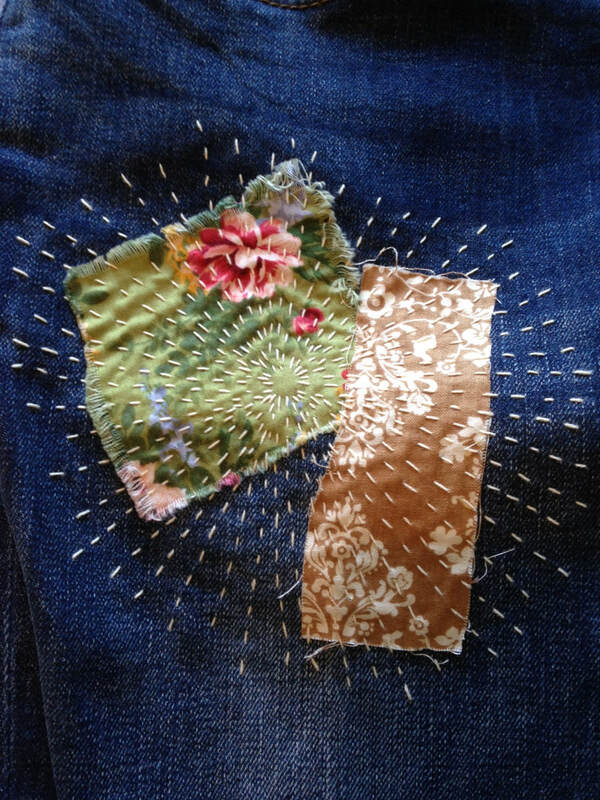 After being motivated to investigate visible mending at Jane Milburn's Slow Clothing Conversation last year, I have been checking out different pictures of this technique on Pinterest. 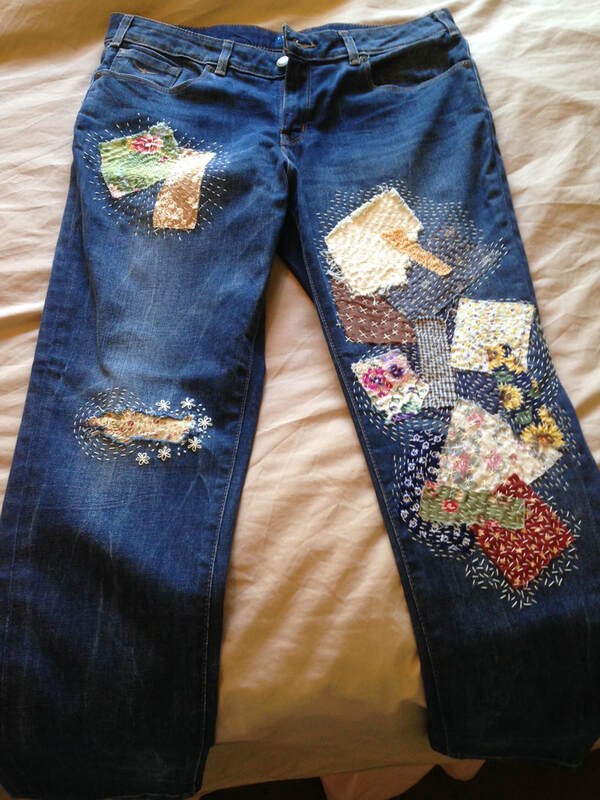 There I came across a form of visible mending that is inspired by sashiko, a form of Japanese embroidery and boro, a traditional style of patchwork used in Japan for mending. 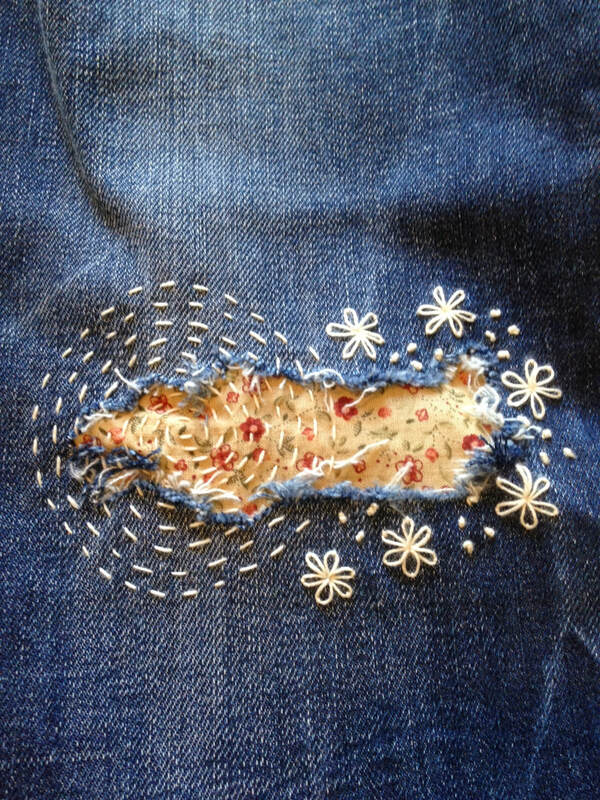 I bought a pair of second hand jeans and I wanted to experiment with different embroidery patterns. 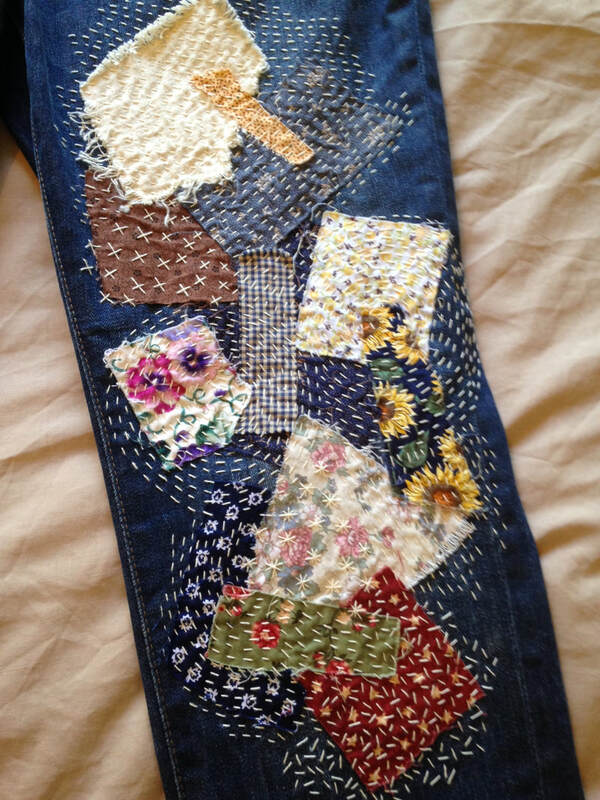 I used a washable glue stick to secure the pieces of fabric to the jeans and crochet cotton for the stitching. It was a lot of fun playing around with colours and patches of material. I also experimented with how to make a hole in the jeans to make it look like a natural hole. Usually with mending you don't have to worry about making a hole! Believe it or not using a razor was the best technique. I am hoping to do a workshop on this technique later in the year so if you are interested keep an eye out for our workshops.
. This will automatically book you in. Price includes a take-home kit with some ingredients to get you started! First of all, the above link is to Michele's blog on SLT's September workshop, well timed with the carnival of flowers this month in Toowoomba! Linda Brennan, author of "A Delicious Bunch" came along and inspired us all with her edible flowers and recipes...and tips on organic gardening. I was very impressed by Linda. She and her husband have even gone to the effort of doing a green house flip on their home, making it eco friendly. She obviously LOVES gardening and eating of her produce. I noticed other little things too, like the fact that Linda wasn't using the latest and greatest kitchen equipment, she was even being green in that department, using her perfectly functional old-style food processor. The above picture is a sunflower seed biscuit, decorated with an array of edible flowers, that we assembled at the workshop. Wouldn't they make beautiful high tea snacks? Beautiful and very wholesome. I believe our next workshop will be with The Source Wholefoods, sharing with us ways to go green and make whole food/organic eating more affordable. Keep an eye out for details! To be the first to know, just email us on the "contact" page and your email can be added to the mailout list. Simple Living Toowoomba April...Birdsong Market Garden Farm Tour! What: Birdsong Market Garden is a local Nutrition Farm. 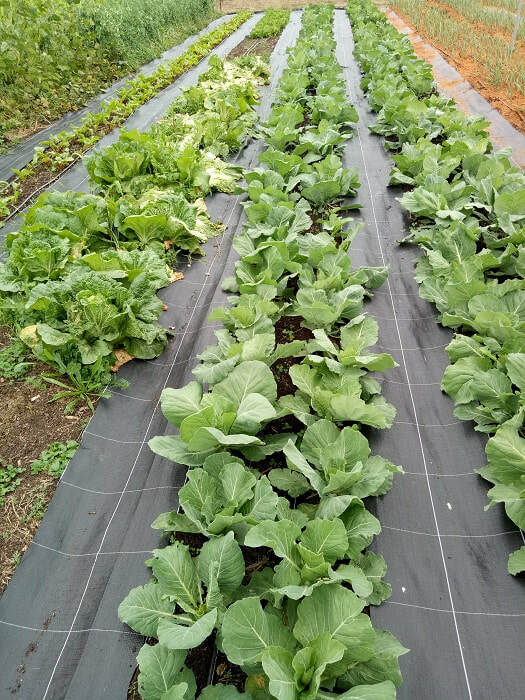 What this means, is that the farm's top priority is producing nutrient dense veg without the use of harmful chemicals and fertilisers. All the produce is grown organically in remineralised soil. Come see the farm and bring your questions for farmer, Rick Cameron. Produce can be purchased on the day if desired, and Birdsong do carry electronic payment facilities. 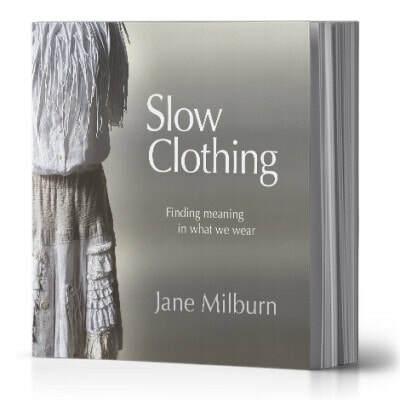 First of all, a big thanks to Jane Milburn, who spoke at out last Simple Living gathering, on Slow Clothing. I loved how down to earth Jane is, as well as creative! And she encouraged us with the fact that she doesn't believe she started out being creative, but rather it was something that grew in her as she created. We just returned home from what I believe was the most relaxing holiday we've ever had! Rick and I read, took the children down to the beach several times a day, explored rock pools and generally took it easy. A lovely change from the constant demands of the farm we run here. Destination: Minnie Water, NSW. Some of you have heard of it, or heard of Wooli, the nearest village. Minnie Water is a rarity in that it's surrounded by National Parks...the Yuragir National Park and the Solitary Islands Marine Park. It can't get any bigger or more populated. If you're like us, that's a big draw card. Not being fans of crowds and the excessive commerce that litters the beaches closest to Toowoomba, we trek down to Minnie Water (an hour North of Coffs Harbour) where it's almost like taking a step back in time and definitely a step closer to nature. We go off season, and usually have the privilege of having the pristine beach all to ourselves! I wanted to mention where we stayed too, because if you like a rustic beach shack (that's also got beach frontage) with all the amenities so all you have to do is BYO food and linen, then the Taipan is a great find. If you go at the right time of year, you can literally watch the whales from the dining room table! It's such a refreshing change from the high-rise apartments and over crowded scene of the Southern QLD beaches, and being in a beach house is also a bit more relaxing than camping...it rained a little every day we were there, which would have been a bit of an issue with 6 children if we'd been staying in a tent! Thanks so much to local herbologist, Josh Neideck, who came and shared his time and knowledge with us yesterday on using herbs! What a turnout! I think it was our biggest class (in numbers) yet. We just managed to squeeze everyone in and Josh managed to answer a lot of questions in between sharing his experience with us. It has been suggested that we ask for more recipes people use for salves and other herb based remedies to post here for those who are interested. One of the basic ways we have used a herb, is picking a leaf of plantain (English Ribwort) to stop bleeding of cuts. I've done this for a slice on my arm , and was really pleased my 10 year old son remembered this little aid when he was swimming at a dam with his mate and his mate got cut. They were nowhere near a house, so my son was able to pick some plantain and stop the bleeding before they headed back to the house. It's very effective! Plantain is a weed at our place, this is what it looks like (above). Very distinct ribbed leaves. In our present state of drought (I know we're getting some rain, but it's still a bit dry here! ), plantain is a little more sparse than in the photo. One thing I learned last year, is that herbs are mineral and nutrient powerhouses. I was looking at the top sources of selenium (an essential mineral) and catnip was right up there after brazil nuts. Then looking further down the selenium list, were virtually all the herbs that help with lactation. Interesting. So in an effort to get more herbs into our diet, we bought the above book, the Herbfarm Cookbook. It's from the 90's I think, but full of French inspired wholesome goodies that feature herbs. I've tried a selection of the recipes, and they're so flavoursome! 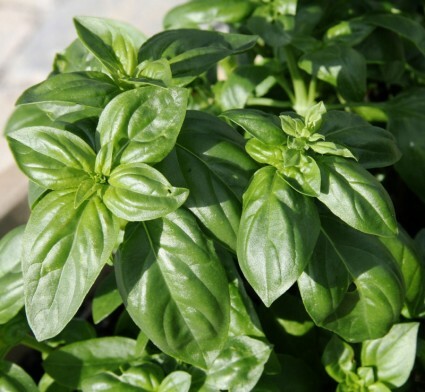 We just don't realise how much flavour we forfeit when we leave herbs out of our meals. 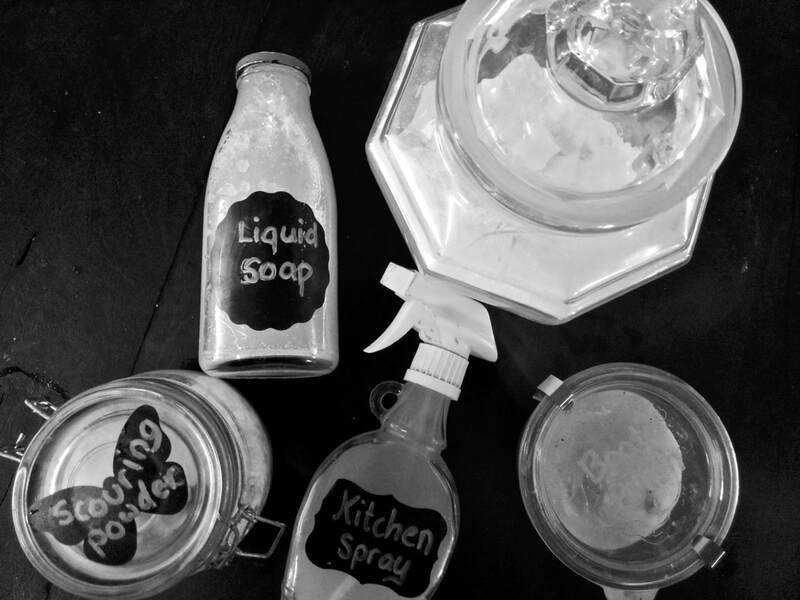 Mix all ingredients in a clean glass jar. Sprinkle a little on a wet toothbrush and brush as normal. So Josh had a list of health aids he suggested, not all herbs. Things like taking bicarb soda to alkalise the gut, colloidal silver as an antibacterial (we've done this, it's amazing stuff! ), apple cider vinegar too. As for herbs, he's a big fan of Feverfew (not so tasty, but great for fighting certain illnesses!). It grows quite well here, our survived the drought with little attention.